My Husband and I made our first trip to Placencia Belize and stayed at The Inn at Robert’s Grove and Singing Sands. I noticed when booking our trip that both were involved with Packing for a Purpose. As an ER RN I immediately knew it was something I wanted to do. I also have a huge love of animals and it was a perfect mix. They were partnered with The Placencia Humane Society and the Placencia Health Clinic. We began purchasing items after contacting both to get an idea of their needs. I let the people that I work with in the ER know what we were planning to do and people were generous with their donations as well. We were able to take three large suitcases of donations. Dr Alex and his staff from the Clinic, as well as Doran and Fred from the Placencia Humane Society were kind enough to come to the Hotel to meet us. 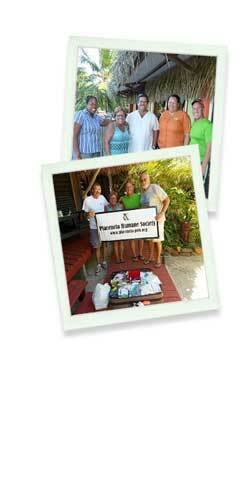 Such warm, wonderful people who do so much for the people and animals of Placencia. Pictures were taken and new friends were made. I will continue to send care packages to both organizations in the future. It was the highlight of our trip! I urge anyone who travels to please participate in this program. I will be sending pictures as well.